In hindsight, my career path formed because of great advisement from incredible people who believed in my potential. I originally came to OCU as a music major, but quickly changed my major during my freshman year once I discovered that I had damaged vocal chords. I knew how much I loved my political science and history classes and later made the decision to major in the social sciences. During my sophomore year, Dr. Richard Johnson shared a National Education for Women Leadership Institute flyer with me and encouraged me to apply for it the following year. I followed his recommendation. Attending N.E.W Leadership was one of the pivotal decisions of my career journey because my experience there reinforced my interest in public policy and later became an assistantship opportunity for me. The political science program at OCU required us to do internships; so I had the opportunity to get direct experience in government by interning for two Oklahoma house members during my junior year and the Lieutenant Governor during my senior year. My internship in the Lieutenant Governor's office turned into a job before I left for graduate school. My initial plan was to go to law school, but my history program adviser (Dr. Jim Buss) recommended that I go to graduate school and apply for a graduate assistantship to help pay for my studies because he knew my goals and knew that path would be best suited for me. I took his advice, attended OU's MPA program and became the graduate assistant for the N.E.W. Leadership program that invested in me two years prior. During my time in grad school, the Oklahoma Policy Institute launched its inaugural Summer Policy Institute for college students and the Research Fellowship program. I had the opportunity to participate in both. The Research Fellowship gave me the chance to contribute my first blog piece to OK Policy on the education funding crisis in Oklahoma. Additionally during my time in grad school, my friend heard about a summer fellowship program focused on education policy and he encouraged me to apply. The Southern Education Leadership Initiative Summer Fellowship program brought me to Little Rock, Arkansas to focus on addressing disparities in school facilities with the Arkansas Advocates for Children and Families. (AACF) Because of that experience, my colleagues at AACF encouraged me to apply for the Center on Budget and Policy Priorities two year policy fellowship program. Because of my experiences with two organizations within the CBPP's network, they selected me to work in Little Rock for AACF for two additional years. Last year, I made the decision to leave Arkansas coincidentally around the same time OK Policy was looking to have a full time legislative liaison in Oklahoma City. So I made the transition back to Oklahoma City to do my dream work of representing the organization at the Oklahoma State Capitol and working with community partners to influence public policy decisions. An average day for me depends on the time of year. In the spring, it looks like early mornings and late nights at the capitol, talking to legislators about opposing or supporting legislation, listening to committee meetings to stay abreast of what is happening, and communicating with my colleagues/other lobbyists/coalition partners about strategies on bills. During the summer and fall, it looks like presentations on legislative process for Oklahoma residents and organizations, meeting with legislators and partners individually to build relationships, and doing things to prepare for the next legislative session (since Oklahoma has a yearly session). I would encourage myself not to worry as much about grades and take more classes outside of my strengths. I would encourage myself not to worry as much about grades and take more classes outside of my strengths. My biggest regret was leaving OCU without taking one of Dr. Willner's economics courses and not taking more statistics courses. I would also advise myself to learn how to incorporate self care in my day to day. Even in my college years, I was incredibly involved and this work requires building personal boundaries and rest (mentally and physically) in order to be effective. 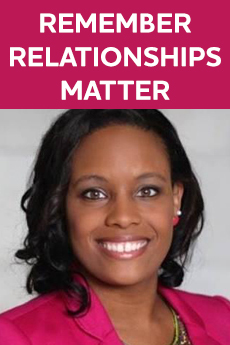 I learned two things: first, that relationships matter. The friends and mentors I gained at OCU continue to strengthen my life personally and professionally. Secondly, my Clara Luper Scholarship Adviser, Clinton Normore, consistently reminded us that "to whom much is given, much is required" and both Presidents Tom McDaniel and Robert Henry pushed the concept of "servant leadership" during my time at Oklahoma City University. Both concepts are hallmarks within my approaches to the work that I do professionally and voluntarily. Working with my colleagues, lawmakers, organizational partners, and Oklahoma residents to kill a bill that would have harmed low income families and elderly Oklahomans financially. I see myself continue working to address social problems through public policy, civic engagement, and community collaborations. Being around my Black Student Association (BSA) family - from hanging out "the caf" and traveling to conferences together to staying up all night practicing for the Homecoming Lip Sync competition and throwing together a float before the deadline.